raja and rani: Raja and Rani is out and about in London! We have ventured out this week to the lovely East Dulwich. Our latest collection is now available to buy from ED Warehouse, a unique concept store where you will find a large range of handpicked quality products for you and your home. Products range from vintage fashion, handmade jewellery, antiques and much more. 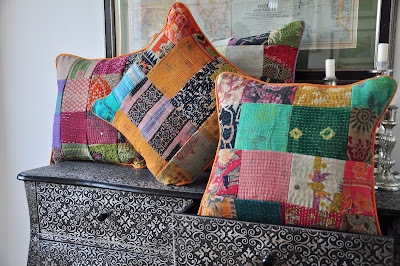 We are stocking a range of our vintage kantha cushions, throws and scarves at ED Warehouse, so if you’re local do pop in! Opening hours are Tuesday – Friday 10.00am – 5.30pm, Saturday 10.00am-6.00pm and Sunday 11am-5pm.